8 Ton weight restriction on the old swing bridge. The old bridge leading to Denton Island. 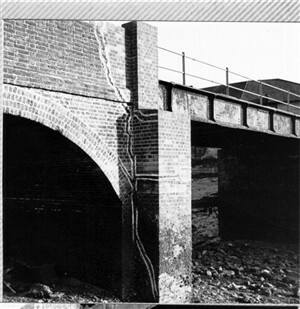 The metal girders were badly corroded and the supporting brickwork for the piers and side arches was breaking up and badly cracked as can be seen from this picture. 12 Ton weight restriction on the old bridge leading onto Denton Island. A very high spring tide under the old swing bridge. When the wind was blowing on days like this, the mini waves and spray subjected the wrought iron girders underneath to salt water attack which caused severe rusting of the girders. This led to a speed restriction of 10 MPH and a weight restriction of 8 Tons being implemented. 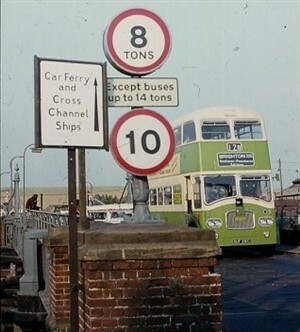 This weight restriction meant that two large vehicles could not be on the bridge at the same time and bus drivers were informed of this ruling. In order to obey this restriction one bus would stop clear of the bridge while another bus crossed. 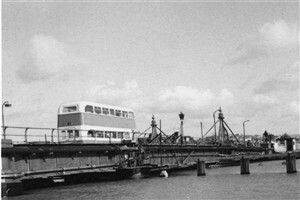 There was even talk at one time of Buses having to unload their passengers before crossing the bridge. The passengers walking across and then re-boarding the bus at the far side. In the event this idea was never put into operation. However the deteriorating condition and the weight & speed restrictions inevitably led to replacement with the present bridge. The old bridge to Denton Island suffered a similar fate due to its deterioration and condition. First a 12 Ton vehicle weight restriction, then reconstruction. At the time, the implementation of the weight restriction caused a headache for the Co-op. They had a dairy depot on the island and the restriction meant their large delivery lorries could not gain access to the island. 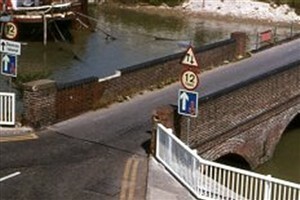 Apart from metal corrosion, the bridge suffered badly from cracking in the brickwork. This was found to have been caused due to the fact that the foundations were laid on timber baulks which dried out when exposed at low tide. This caused the brickwork to settle and cracks appear between the brick courses. When the tide came back in, the timbers then swelled again and the brickwork was again subjected to movement. Understood - thank you. I was not aware of that, my memories are from the late 50s and 60s.